Lecture and Meditation Session with Sister Dang Nghiem. Global Studies and Languages at MIT is inviting you to the second lecture in the annual T.T. and W.F. Chao Distinguished Buddhist Lecture Series. Sister Dang Nghiem is a monastic disciple and translator of Zen Master Thích Nhất Hạnh, celebrated by Martin Luther King Jr. as “an apostle of peace and nonviolence.”Born in Vietnam during the Tet Offensive and coming to the US as a refugee, Sister Dang Nghiem attended medical school and became a physician before deciding to enter monastic life. She will present her public lecture on March 7, and together with Sister Truc Nghiem will lead a meditation session the following day. 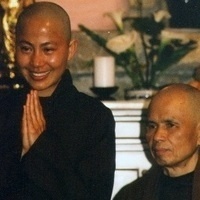 Sister Dang Nghiem is a monastic disciple of Zen Master Thich Nhat Hanh. She is the author of two books Healing: A Woman's Journey from Doctor to Nun and Mindfulness As Medicine. Born during the Tet Offensive and part of the group of Amerasian children given amnesty after the Vietnam War, she arrived in the United States penniless with a younger brother and lived in foster homes. She went on to graduate from high school with honors, earn two undergraduate degrees, and receive medical training at UCSF School of Medicine. In 2000, Sister Dang Nghiem left medicine and became a Buddhist nun in the Plum Village tradition of Zen Master Thich Nhat Hanh. In 2011, Sister Dang Nghiem contracted neuro-Lyme disease, a rare and severe form of the disease that affected both her physical and cognitive abilities. Strongly determined, she applied her mindfulness practice and medical knowledge to heal her illness and, subsequently, wrote the book Mindfulness As Medicine. Sister Dang Nghiem is a motivational speaker and an inspiration for anyone who has ever suffered from childhood abuse, trauma, life-changing loss, severe illness, or chronic disease. She currently resides at Deer Park Monastery. Sister Truc Nghiem is a monastic disciple of Zen Master Thich Nhat Hanh since 2002. She had been trained as a nurse in Vietnam before she came to the United States. She currently resides at Deer Park Monastery. I saw the Dela Lama in Perth Western Australia a few years ago and I thought he was amazing. I was working for http://freotowing.com.au at the time and took the day off.